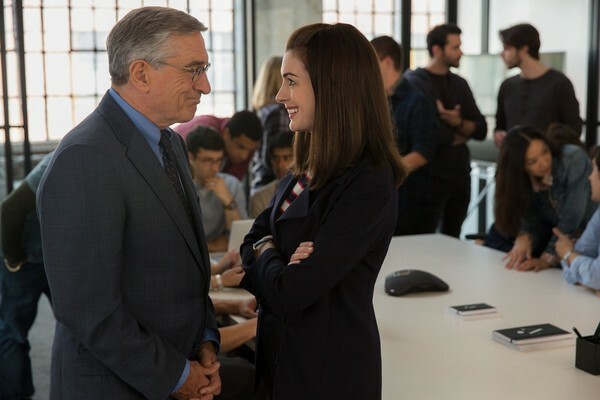 The tableau of The Intern unspools like the unofficial sequel to The Devil Wears Prada, with Anne Hathaway’s Andy Sachs now the ambitious yet affable head of her own e-commerce fashion company, herself forced to balance the demands of work and family. In truth, the two main characters in this latest feathery film from writer-director Nancy Meyers shrewdly project the two actors playing them. Ben Whittaker (Robert De Niro) is a 70-year-old widower retired from a 40-year career in the phone book production business. Ben wiles away his lonesome days with 7:30 a.m. coffee at Starbucks, tai chi and periodic trips to San Diego to visit his son and grandchildren (none of whom we meet, curiously). He’s used up all his airline miles and, he fears, his usefulness. A flyer advertising a Senior Internship Program at the Brooklyn-based workplace of About The Fit catches Ben’s eye. A video resume later and Ben milling around the company’s refurbished digs and assigned to Jules Ostin (Hathaway), its founder. Jules is the sort of spunky stereotype who bikes to and inside the office (a quirk that totally vanishes as quickly as it's introduced) and ventures to the shipping warehouse to correct the way they fold the tissue paper. She's also the sort of workaholic whose career detracts from life with her moppet and stay-at-home husband/dad, Matt (Anders Holm, with a performance that’s forgettable in real time). The hook is that Ben’s snappy charcoal suits, 1973 attaché briefcase and flip phone stand in sharp relief to today’s casual Millennial milieu. Predictably, Ben shows the young'uns a thing or two and proves the deus ex machina for Jules’ home and work woes, including a looming decision whether to hire a CEO (from all male candidates, a gender dynamic never explored) to relieve Jules’ workload and further grow her 18-month-old clothing enterprise. Jules, like Hathaway, is a female rising star in a male-dominated corporate world whose career success has coincided with dark times in her romantic relationships. Ben, like De Niro, is a former titan of his industry seemingly rendered obsolete by age and changing culture. Neither De Niro nor Hathaway appear at ease here when isolated on camera or with other castmates. However, there’s palpable, platonic chemistry whenever they’re paired off, and the parallels with their characters subtly surface during their byplay. That said, The Intern is still a treacly, ethnically homogeneous Nancy Meyers joint (see also: Something’s Gotta Give, It’s Complicated, and The Holiday) with missteps massive and minuscule. A mid-film sequence involving an errant e-mail Jules sends her unseen mother devolves into a heist op that undercuts Jules and Ben’s characterizations. Ben’s dalliance with Fiona, the flirty office masseuse (right …) played by Rene Russo, is a needless subplot that begins with a back rub turned De Niro chubby, something I could have gone my whole life without seeing. And while De Niro and Hathaway are terrific, their amiable characters are ultimately uncomplicated. Jules has professional and personal obstacles, but nothing that time and a few tweaks don’t tidily resolve by film’s end. And Ben’s sage sensei comes sans any background messiness. He’s the embalmed embodiment of a romanticized era, where men were men and women, well, can be men, too.